Our readers voted for the hottest fitness, health and lifestyle businesses and individuals in town. This is the first grouping of the top 10 in each category. Look for more categories and profiles in future issues of Fit941. BluFit Recovery and Nutrition specializes in fitness recovery and overall wellness. Their concept caters to fitness and wellness fans and people dealing with chronic pain. The facility offers Cryotherapy, Infrared Anti-Aging Pods, Compression Therapy, Pulse Electromagnetic Field Therapy and nutritional counseling. Cryotherapy triggers the body’s natural healing process and results in numerous health benefits, fitness recovery, and inflammation reduction. If you are an elite athlete, weekend warrior or soccer mom, Cryotherapy can help you recover from physical activity faster, providing you with energy and vitality. Cryotherapy is a powerful option to help with inflammatory disorders and injuries. Whole Body Cryotherapy may boost the body’s metabolic rate and may accelerate weight loss. Professional sport athletes have discovered Whole Body Cryotherapy as a powerful option to decrease recovery time and increase athletic performance. The Infared Health Pod creates a profound sweating response, which encourages the natural removal of impurities and a healthy cardiovascular response. Additionally, heating the body promotes physical fitness by assisting with weight loss goals and maintaining a healthy weight—you can burn up to 300-600 calories per session! Compression Therapy helps maximize recovery for both athletes and non-athletes. Using Sequential Pulse Technology, NormaTec compression therapy synergistically combines three distinct massage techniques to speed the body’s normal recovery process: pulsing compression, gradients, and distal release. Through these mechanisms, the NormaTec Recovery System maximizes circulation throughout the body to help you look better, train harder, and recover faster. For more information on BluFit Recovery and Nutrition, visit BluFitRecovery.com or call 941-677-CRYO. When was the last time you had a truly therapeutic massage? One that not only made you feel better but made you do better the next day!? Kinetic Sports Massage provides that kind of massage. You might have seen one of the six Kinetic therapists at any number of events from the World Rowing Championships to veteran’s retreats or at any number of local running events. Kinetic therapists are well known in the athletic community and beyond. 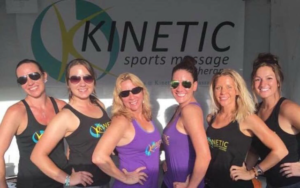 With clients ranging from school teachers, to Olympic hopefuls and pro athletes, regardless of athletic, fitness, or working background; the Kinetic therapists have a unique way of tailoring a massage to individual needs. Your new year may involve resolutions to increase your work productivity, have more energy to spend with your family, or to run your first 10 K; Kinetic Sports Masage’s varied and customized treatments will help you attain those goals. They incorporate Neuromuscular, Swedish, Thai, Cupping, stretching and more to make sure it is a personalized fit. 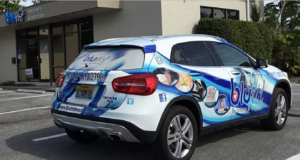 Two locations; Sarasota and Bradenton, and an easy on line booking system ensurean easy and rewarding experience. Check out their website at KineticSportsMassage.com, and like them on Facebook to make sure you are always on track to stay on track. For appointments call 941-320-9951. X30 Fit is an expert in Fat Loss and Functional Fitness. They Specialize in 30-minute Fat Loss workouts that are fun and challenging every time. Results Guaranteed. X30 Fit Boot Camp is a group personal training program where you’ll get high energy, fun, and challenging workouts designed to burn maximum fat and tone your entire body in only 30 minutes. Their specialized Afterburn workouts use a combination of (HIIT) High Intensity Interval Training and Active Rest Training to get the body to burn more fat and calories than traditional workouts that are twice as long. Every group training session is led by an experienced and certified personal trainer and is designed to be fun, high energy and challenging all while burning maximum fat and toning muscles. Nearly every session has 2 or more Trainers. Personalization is key to getting the best possible results, which is why their workout programs are modified to fit your individual fitness goals and fitness level. Whether you’re new to working out or you’re an experienced fitness buff their professional trainers and coaches will help to modify every workout so that you’ll achieve your goals. X30fit workouts are done in a dynamic group setting which makes them fun, motivating, challenging and it keeps the cost of working with a certified personal trainer affordable compared to private one-on-one personal training sessions. For more information on X30 Fit, visit X30Fit.com, or call 941-932-4440.